You may have heard people saying that rock is dead, but there have been some great albums released this year, and next year is already shaping up to be another great year for fans of rock music. 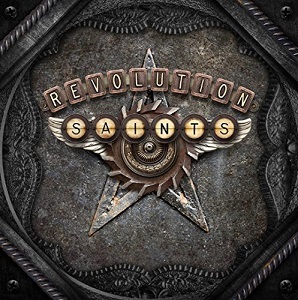 Several bands have albums due for release in the first few months of 2015, and I've already heard three absolutely superb ones, and one of those is the debut album from new band Revolution saints. It's an album that really sets the bar very high for other bands to try and match. So who are Revolution Saints? Well they are three musicians from well-known bands - on guitar you have Doug Aldrich (ex Whitesnake), on drums and lead vocals, Deen Castranovo (Journey) and on bass and vocals is Jack Blades (Night ranger). That's a pretty impressive lineup. They also have Alessandro Del Vecchio guesting on keyboards, as well as two members of Journey guesting - Arnel Pineda contributes vocals on "You're not alone" and Nel Schon performs a guitar solo on "Way to the sun"
"You're not alone" sees Deen Castranovo and Arnel Pineda sharing lead vocal duties. For fans who buy the Deluxe edition, the bonus tracks include two alternative versions of this song - one with just Arnel's vocals and one with just Deen's vocals. The first single to be released from the album is "Turn back time" - check out the video below. If that doesn't make you want to buy the album I'd be surprised. A superb album that I can't recommend highly enough.